This work beguines on October 2004, the process of creation was my personal need of making big gestational paintings without spending miles of paper and liters of ink. As the result of this experiences I made 3 gallery exhibitions. 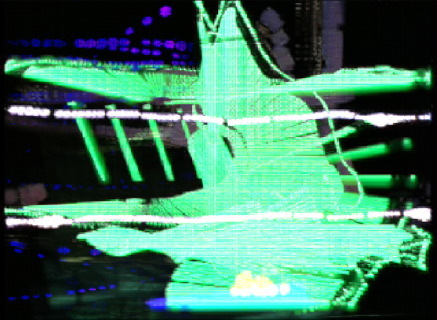 In 2004 in collaboration with ARTSHARE I get to do this work „life“, for that we developed a Max/MSP/Jitter application. The idea was to develop a way that allows the audience to actually see the painting act life. The setup is based on this application, running on a windows computer, a video camera, a video projector, a semi-transparent 8m x 4m video-screen and all kinds of light I found and can manipulate as a „brush“. I presented this work in some major art events in Portugal, as a sound and image performance. The sounds are also generated by the light, and change according the intensity, speed of the gesture, color and position of the lights.The reactions were very positive and everybody was amazed by the „magic“ of the show.